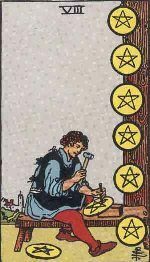 The Eight of Pentacles card usually indicates small profits and small improvements in the work life of the enquirer. It can also indicate that the enquirer pays too much attention to matters of minor importance. 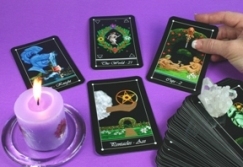 The Eight of Pentacles or the Lord of Prudence is not all about observing austerity. It only indicates that you should manage your financial resources more intelligently. 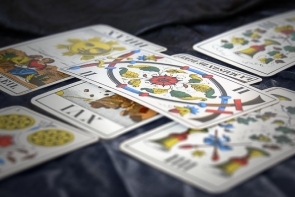 The appearance of this card along with the cards such as the Ten of Swords or the Five of Pentacles may be more portentous about your material welfare. If it appears just alone, there should not be any real cause for worry. It only gives a warning that you may incur an unexpected expense and the situation can be saved with prudent and skillful money management. If you are thinking about your spiritual growth, this card may alert you about the upcoming opportunities in this direction. You may also be warned to deal with your stress and pressure carefully. This is an opportunity to correlate your energy management with your material achievements.